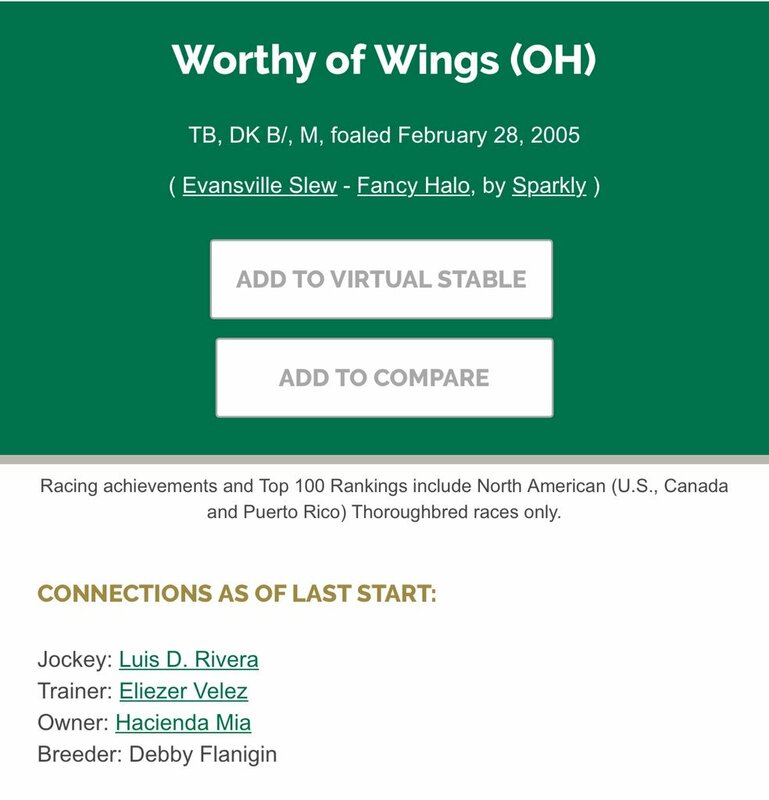 WORTHY OF WINGS (2005 Ohio-bred Mare 138-starts) - Today was her http://Last.Day.At.The.Race.Track She raced 72 times in Ohio, 10 in PA, 2 in AR, 3 in WV & 51 in PR. She’s done her job faithfully! @CaribbeanOTTB will give her R&R and work on aftercare plans. WORTHY OF WINGS 13y Ohio-bred M with 138-starts waiting patiently for the CTA trailer to pick her up! Nice article at BH about Reynaldothewizard. Sounds like he is going to one of Darley's farms in England. It isn't as sunny as Dubai, but I feel like despite the sun, Dubai doesn't quite have the rolling green pastures that Ol' Reynaldo has earned. Whether he is retrained as a riding horse or not, he's earned lots of turnout. I'll miss him on the circuit. Him and Barbecue Eddie were old favourites of mine. 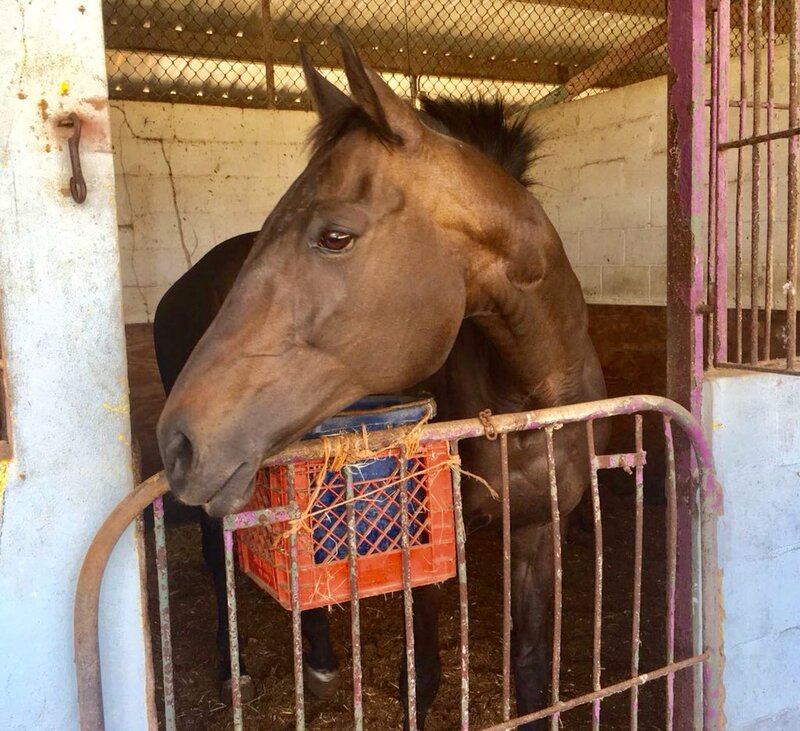 11yo g Barrel Knot (Freespool - Benedictine, by Bien Bien), 1st at Turf Paradise (4/10/18). 101 - 16-10 - 20, $326,746. 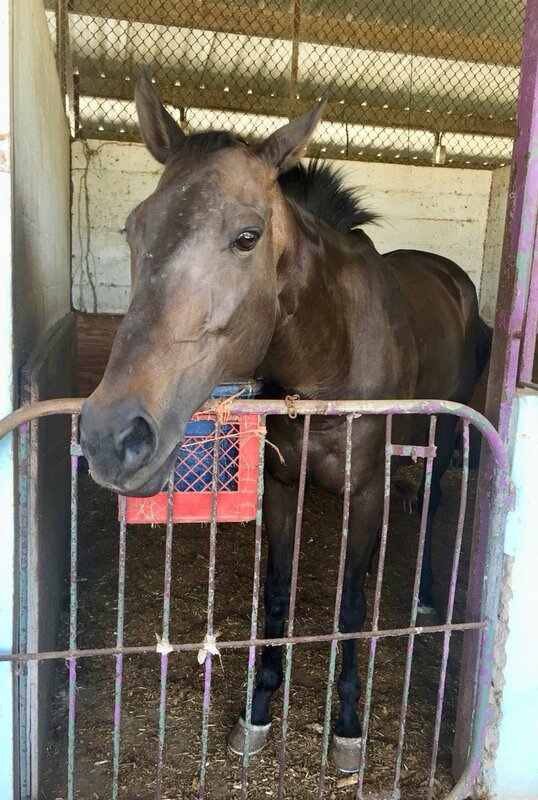 10yo g The Fourth Estate (Mass Media - My Oasis, by Meadowlake), 1st at Turf Paradise (4/3/18). 91 - 11-25-11, $195,822. 10yo g Four Left Feet (Trippi - Romance Dance, by Vision and Verse), 1st at Hawthorne (4/6/18). 76 - 11-16-10, $433, 271. Stakes Winner. 10yo g Aroney (Aptitude - Ambling, by Chester House), 1st at Will Rogers Downs (4/9/18). 92 - 12-14-15, $249,256. WarBiscuit- I looked up Frisky Ricky on equibase - the last 2nd place finish I see for him is in 2014, and I didn't see any recent van offs. Are they not up to date on their info? However, what I do see is that he is a horse who sadly has been performing pretty poorly for awhile and could use a retirement. He has been running mostly second to last for quite a few races, with a rare 3rd place thrown in. genuinerizk wrote: WarBiscuit- I looked up Frisky Ricky on equibase - the last 2nd place finish I see for him is in 2014, and I didn't see any recent van offs. Are they not up to date on their info? However, what I do see is that he is a horse who sadly has been performing pretty poorly for awhile and could use a retirement. He has been running mostly second to last for quite a few races, with a rare 3rd place thrown in. Frisky Ricky was a Quarter Horse (1,000 yard) affair on April 10th. The "vanned off" comment appears in the footnotes. A good number of these older horses we follow will run in both TB and QH races, particularly out west. This race saw Frisky Ricky, Albacore Bob and Barrel Knot (the winner) entered, and they usually find themselves racing with fellow TB's. As such, their statistics will show up on two different pages at Equibase. With regard to FR, he did finish the race and was vanned off afterwards. Hopefully, it was just a precautionary measure and if anyone has news about him - please post. Hope this helps, genuinerizk ! 10yo g Moments Notiz (Tiznow - ABC Amanda, by Alphabet Soup), 1st at Charles Town (4/18/18). 60 - 23-15-8, $479,737. 10yo g Moorestown Jackie (Toccet - Moorestown, by Allen's Prospect), 1st at Penn National (4/19/18). 78 - 16-10-16, $339,704. 11yo m Impulzive Kate (Pulzarr - Katherine Louise, by Swoon), 1st at Sun Downs (4/21/18). 71 - 31-14-10, $67,572. 1st start after a fine 2017 season. 10yo g It Doesn't Add Up (Speightstown - So Sorry, by The Prime Minister), 1st at Sun Downs (4/21/18). 70 - 21-10-13, $140,587. Tesoro Borincano - 11h, Well's Gold - 10g, Unitas - 10g. 13yo g Bank of Dad (Valid Expectations), makes his 2018 debut at Thistledown in Race 8 on Monday, April 30th. 127th start, looking for his 26th win. 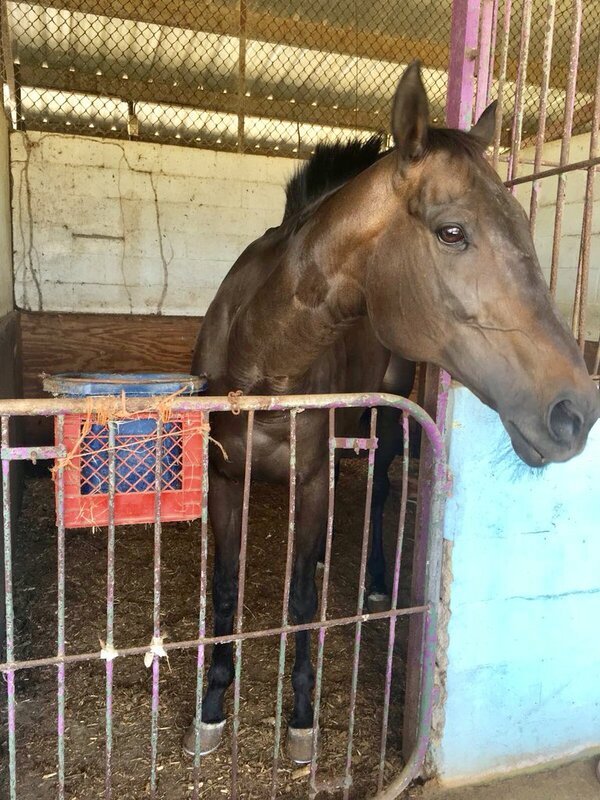 11yo m Honeylyn (Ring), makes her 12th career start, and first in 5 years, at Tampa Bay Downs on Friday, April 27th in Race 8. Last raced at Colonial Downs. Not many horses in training still have Hollywood Park show up on their lifetime past performances, let alone a stakes horse still capable of running at a high level. Benowitz Family Trust, Mathilde Powell, and Paul Viskovich's Soi Phet fits that unlikely billing, however, and could have his best shot at graded stakes glory—at the age of 10—April 28 in the $200,000 Californian Stakes (G2) at Santa Anita Park. The California-bred Tizbud gelding has been an unquestioned success since his first race off the claim for trainer Leonard Powell. A $16,000 claim by Powell out of a conditional claiming race at Hollywood in May of 2013, Soi Phet won his next four starts at allowance levels, then finished third in the Awesome Again Stakes (G1) at Santa Anita. Since the claim he's won six stakes (four in Cal-bred company), placed in six others, and has turned that $16,000 investment into $854,170 in earnings for his connections. But since the 2013 Awesome Again, graded tries have not gone so well. In five attempts at the graded level, he's yet to hit the board, but there also won't be a dominating standout among the six entered in Saturday's Californian. "I would have preferred to run him in a Cal-bred stakes, but there's really nothing available to him until (the July meeting at Los Alamitos Race Course)," Powell said. "I don't want to risk him for a tag again this year and this probably didn't come up as strong as it should for a grade 2." His reference to a claiming tag relates to Soi Phet's 2018 debut, when he was up for $62,500 in a 1 1/16-mile optional-claiming allowance at Santa Anita. Despite a less-than-comfortable trip, Soi Phet finished second to fellow Californian entrant Prince of Arabia, and went unclaimed. "It was nerve-wracking (running him for a claiming tag), but every time we run a horse it's nerve-wracking," said Powell, who has saddled the dark bay 40 times in his 56-race career. "He's 10-years-old, so if somebody wanted to put up that much, it would have taken a lot of (courage)." Soi Phet finished 5th beaten by 18 1/2 lengths, on April 28, 2018, at SANTA ANITA PARK in Race 5. Bank of Dad came in last in his race yesterday, beaten by 13 1/2 lengths. According to the chart had to check hard. Thank goodness this old warhorse came home safe. And WarBicuit- thank you for teaching me about a feature of equibase that I didn't know existed! Although now they changed much of their format again, so there 's a lot of new things to get used to again. 10yo m Z Lovlee Linda (Alysweep - I'm Exclusive, by Premiership), 1st at Finger Lakes (4/23/18). 84 - 17-18-14, $148, 921. 10yo g Epic Cast (Freespool - Murderer's Row, by Grand Slam), 1st at Sun Downs (4/22/18). 52 - 22-8-10, $63,435. SW.
10yo g Surf N Ski (Unbridled Native - Oceans N Mountains, by Manilla), 1st at Sunray (4/28/18). 43 - 17-4-5, $270, 756. 11yo g Gunsmoke N (Scottish Halo - Jessica's Answer, by Welcome Suitor), 1st at Will Rogers Downs (4/28/18). 36 - 5-4-4, $141, 940. 11yo g Credit Report (Songandaprayer - Cash No Credit, by West by West), 1st at Prairie Meadows (4/29/18). 84 - 21-15-15, $426,614. 10yo g Just Chillin Boss (Sweetsouthernsaint - Aleutian Gold, by Prospector's Gamble), 1st at Belterra (5/6/18). 71 - 17-13-6, $247, 776. SP. 10yo g Diesel's Prize (Pure Prize - Whisperifyoudare, by Red Ransom), 1st at Fonner (5/5/18). 55 - 13-8-11, $232,232. 11yo g Pure Vertical (Hidden City - Hagerstown, by Benton Creek), 1st at Lethbridge (5/5/18). 45 - 7-11-14, $28,181. (MX) race. My Charming Clyde - 11g. Dorothy's Diamond - 11gAlbacore Bob - 12g, Lotto Cat - 10g. 12yo g Casa O (Pure Prize) finished Race 3 at Turf Paradise yesterday (5/5), and came in 7th, but was vanned off afterwards. 10yo Slim Shady has a good shot in Belmont's 9th today, 5/1 on the morning line. Perhaps not an official War Horse yet, but definitely a stab from the past. A seemingly-ageless Slim Shadey won by five, and pretty easily. I'll never forget the roar from the crowd whenever he set foot on the track. Old Friends lost 20yo Tour of the Cat on the same day. RIP Catlaunch and Tour of the Cat. Trelawny (11 year old gelding) deadheated for the win today at Emerald Downs. That old boy is as honest as the day is long. 13yo Bank of Dadin at Thistledown again tomorrow, Race 8. Fingers crossed for this old warrior to come home safe.